PLEASE DESCRIBE WHO OR WHAT INFLUENCED YOUR DECISION TO JOIN THE COAST GUARD? 1978 battles. I had 3 uncles and an older brother in the US Navy. I joined the Maine Army National Guard in 1978 my junior year in high school. I went to Army Basic Training in August 1978 at Fort Dix NJ. Then I graduated from high school 5 months early in Jan. of 1979. I went back to Ft. Dix for my AIT Power Generator and Wheel Vehicle Mechanic school in Jan of 1979. Then back to my Guard unit in Belfast, Me. I became an M-60 Machine Gunner at 17. My assistant Gunner was a Nam vet Marine who taught me very well in the use of the 60. We had our summer training in North Dakota in June of 1979. I asked a friend when he thought they would put me in the motor pool and he said probably when my 6 years were up. I was offered OCS school, but I gave it some thought and decided I wanted a change. Since I grew up on the coast of Maine and most of my friends and their dads were fishermen, I decided that I would join the US Coast Guard. After attending prior service Boot Camp at Cape May NJ. I was assigned as an SA, aboard the CGC Gallatin from August of 1979- December of 1980. I worked in the engine room for MK1 Steve Brown, Mk1 Clark and MKCS Defrancisco. I switched to FA, made FN, then off to MK-A school in lovely Yorktown Virginia. I graduated as an MKFN. I was then stationed at the 378 MAT in Boston, MA from 1980-1983. I worked for MKCS Calvin Smith. He was awesome to work with, he taught me alot about rebuilding Fairbanks Morse engines, and Gas turbines. Our shop was next door to the assist team so I got to work with some great folks there also. Two of my favorites were MKCM Stanley Hiller, and MKCM Gerry Poliskey. left the Mat team as an MK3, to serve aboard the CGC Duane WHEC 33. 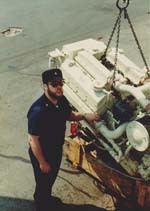 I worked in the engine room for MKCM Duke (Gary) Snyder. I worked my way from Oiler up to Second Throttles. I loved working on that ship, I was always proud every time I walked down the pier to get aboard her. I received the Commandants Letter of Commendation while on board the Duane. Probably one of my biggest achievements, beside’s jumping on a forklift and putting boulders on the base of the LORAN tower in Lampedusa Italy during a 60+ mph wind storm and helped keep her from blowing over!! That was from 1984-1985. I worked with a great crew there also. From the Skipper Dave Mogan on down!!! I made MK2 and after a year in Italy I was told I would get choice of duty, I wanted Alaska, but that never happened. I was stationed back in Boston at the 270′ Mat. I then transferred to the CGC Spar WLB 403 which I enjoyed. I was in A gang. In 1986 I transferred to Rockland station which was in my home turf. I love working SAR. Anytime I heard the alarm go off I was running for the boats. While in Boston I had dislocated my right shoulder twice. I had surgery and they gave me 45 days to heal up then I was back turning wrenches. It eventually got bad enough that I sadly had to get out in Jan of 1988. It definitely was an adventure I wouldn’t trade for anything. My only regret is not staying in long enough to retire!!! While on board CGC Gallatin, we were at GQ for 3 days straight chasing a submarine off of Cuba keeping her from surfacing, while waiting for the USN for an assist!! That was pretty awesome. 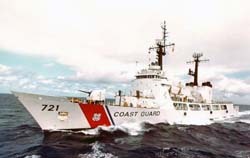 I also remember doing Haitians ops while on board the CGC Duane. All those poor women and children. Pretty sad duty. I loved all my duty stations. I remember how proud I was every time I went aboard a ship. Seeing floaters in NYC, and Boston is something that’s kinda hard to forget. While living in Hyde Park just outside of Boston, my friend and shipmate Bob Wilson and I saw an accident where a drunk driver t-boned a 16 year old boy and his girlfriend. She got out okay but he was trapped. We got there the same time as the 1st responders. We helped rip the door off, then got him out and we started performing CPR. He was vomiting up blood and I knew it wasn’t good. The ambulance got there and took over. I read in the paper a few days later that he had died!!! Commandants letter of Commendation!!! 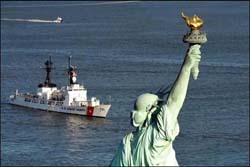 I helped save the USCG alot of money by just doing what I had been trained to do!!!! In August of 1979 MK1 Steve Brown handed me Louis L’amours “Fair Blow’s the Wind” and I’ve been reading and collecting Louis’ books ever since. I even have an autographed one. I worked for some great people and with some great people. They all had an impact on me. MKCM Calvin Smith had an positive impact on me. Captain Arthur Solvang, CO of Base Boston, MKCM Gerry Poliskey, MKCM Stan Hiller, MKCM Harvey Fenton, MKCM Duke Snyder, Lt. Commander Lawrence Murphy, my last CO on the CGC Duane, CWO4 Nim Gray. I could go on for days!!! I only met a few Coasties I didn’t like! USCGC Gallatin. I’m in touch with several shipmates from my days aboard the old gal. Fran Dietrich my engine room soogie partner getting her cleaned up for New Yorker magazine to come take pics lol. 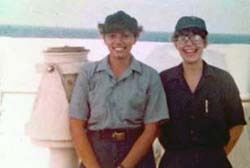 EM3 Peggy O’Neill, I remember breaking in on 4-8 oiler rounds with Peggy she was an awesome shipmate. Just got in touch with MK3 Mark Sullivan from my Gallatin days!!!!! 378′ Mat I stayed in touch with quite a few folks from my days in Boston, many have crossed the bar, fair winds to them. I stay in touch with Gerry Poliskey, Mark Powell, Paul Holmes. I would like to get in touch with MKCM Calvin Smith, I’ve tried getting a hold of him. Last I knew he retired and was living in Plymouth, MA.!!! CGC Duane, CWO4 Nim Gray was our Main Prop advisor and I still call him Mr Gray. He’s a great person. I still hunt with MK1 Charles Dean. The Hamilton twins crossed the bar. Chris Mcgilvery and his Coastie wife Jeannie are still in touch. Paul Ludden, Pat Mccauley, Thomas Porter, XO Chuck Hill, Doug Harvey, Dave Hutchinson, Mike Snopko, Marvin Dunmeyer, Wayne Jarvis just to name a few! WHAT PROFESSION DID YOU FOLLOW AFTER YOUR MILITARY SERVICE AND WHAT ARE YOU DOING NOW? I cut gemstones, make jewelry, and Native American flutes for fun. American Legion, and lifetime member DAV. they have helped with my VA claims! I was doing some service officer work with the Legion for a few years. IN WHAT WAYS HAS SERVING IN THE MILITARY INFLUENCED THE WAY YOU HAVE APPROACHED YOUR LIFE AND YOUR CAREER? I still like to help people in trouble. I always kept good work ethics and a positive attitude, I worked on quite a few Coast Guard Cutters even after I got out. BASED ON YOUR OWN EXPERIENCES, WHAT ADVICE WOULD YOU GIVE TO THOSE WHO HAVE RECENTLY JOINED THE COAST GUARD? Hang in there, and thanks for your service. Don’t ask people to do anything your not willing to do yourself! I’ve gotten in touch with some of my old shipmates. Thanks to TWS, Fred’s Place and Facebook.